Oh thanks for the tip Carole, never thought of using silk scarves before myself. Would definitely make the inside as pretty as the outside. Yes! I totally agree. I feel like the 'other side' of the hat is like a secret... the only times I get to see them is when the buyer sells them on and posts photos online! Here's my latest... I like to line (usually with silk dupion which blocks amazingly) where I can, especially when blocking sinamay as it takes away the transparency. My labels were bought online and are sewn in. Sometimes I feel like I need an algorithm to figure out what I need to do before/after what! Hi! I ALWAYS put full linings in my hats. 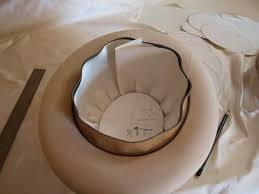 My linings are almost always dupioni silk in white, ivory or if I have it, a matching color for the hat. (I probably have close to 75 hats and maybe 6 or 8 of the old ones don't) In my opinion, If you want to be considered a professional, you have to make your products look professional. To me this means no threads showing, no extra marks, no messy, tacky undersides or insides. One of the first things I bought when I started with millinery is labels. A professional milliner needs professional labels. I have had the misfortune of having two label makers that have gone out of business after my labels and so all of my sets of labels look different. My third set has a rose, my shop name, my site address and my email. A professional has to be accessible if they want business. If a customer can't find you quickly, they will go somewhere else. They also have to bend over backwards (If they can) with customer service. As for feathers, there are times when sewing feathers just won't work and if you want the feather to stay, you have to glue it. I use "Beacon's Fabric Tac" glue. It will glue fabric to ANYTHING. It doesn't spot like a glue gun (you don't see where you have glued it.) , it doesn't smell or have fumes and it's easy to use. The only problem is that you have to watch your fingers very closely because glue>fingers>hat> ugly spot that is difficult to get out. I live in the states and it is available at JoAnn's fabric. I haven't checked Michaels or Hobby Lobby but I know JoAnn's has it.